You’ve been tricked in your AEPA Early Childhood test prep. Lied to by your Arizona Educator Proficiency Assessments study guides. Coerced to believe that AEPA Early Childhood study guide and practice tests cover the real test. Those AEPA study guide books, practice exams and review classes only scratched the surface. 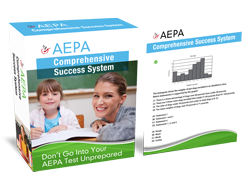 …Because you can’t pass without a AEPA Early Childhood study guide and practice test questions that show you the actual exam in advance. Also, don’t let the fact that it is an early childhood test geared towards teaching young children fool you. The AEPA Early Childhood exam is a rigorous exam. Even though some days working as an early childhood teacher may feel like child’s play, it will take serious preparation to do well on this exam. So what do I mean by all this, exactly? Well, I can either leave you sitting there to wonder, or I can give you a taste of the AEPA Early Childhood practice secrets that exam developers don’t want you to discover. Grab a cup of coffee, sit back and relax – because I’m ready to blow the lid off of these Arizona teacher tests once and for all. You’ve fallen into a habit – and as far as your test score is concerned, it’s the worst habit you could find yourself in. When you read through any AEPA Early Childhood practice questions, it might be tempting to look directly to the answers and then make your choice from there. But if you’re doing that, then I have a piece of advice for you: DON’T. Your AEPA Early Childhood exam expects that from you – and it’s a surefire way to lose out on beneficial testing points. In AEPA Early Childhood practice tests, get in the habit of first identifying the age of the children in question. So for example, if the AEPA Early Childhood question is asking you to cite how to encourage group work in the classroom, then identify the age and the goal, which is to promote useful group work without one person shouldering all the responsibilities. The right answer should stick out to you like a sore thumb! Beyond this approach, if you want to do well on this exam, you will need to have a good understanding of what it covers. At its foundation, it tests your knowledge of childhood development theory. More specifically, it tests your knowledge of childhood development theory encompassing ages from Birth to Age 6. Now that you have narrowed down the age group that you will be tested on, let’s delve deeper into the actual theories within this age group that you need to know. This exam will test you on theories of childhood development of intelligence and creativity. You will also be tested on the stages of cognitive, social and physical development for this age group. There are two additional critical areas that this exam will cover that one could easily overlook when studying for this exam. While the traditional and expected questions of child development theories like social and cognitive development are certainly on this test, the areas of developmental delays and developmental abnormalities will also be queried. Specifically, the exam will challenge your knowledge and understanding of key concepts in the definition, causes and symptoms of developmental delays. It will also be testing your comprehension of developmental abnormalities and how they can potentially impact and affect learning. If you integrate these subject areas into your exam prep, you will be well on your way to conquering this test! Think that choosing the correct answer in the multiple choice questions or practice exams means finding the answer that’s the “most right”? Think again – instead, approach those multiple choice questions by analyzing and determining what’s wrong about all of the others. The makers of this Arizona teaching assessment love to trip you up by including answers that could potentially be appropriate. If you approach the questions in this manner, you’re bound to get tripped up. But if you approach it by showing why all the other answers are wrong, then you’ll be more confident about your answer choice. And confidence is key when it comes to mastering your AEPA Early Childhood exam practice. In addition to studying the appropriate developmental theories and approaching this exam with these strategies in mind, you can also increase your chances of doing well on this exam by using a AEPA Early Childhood practice test at home with the exam’s parameters. You are allotted 3 and a half hours to take the test which is comprised of about 100 questions. Remember that three of these Arizona Educator Proficiency Assessments questions are essay response questions, so a good way to prepare is to time yourself writing these types of responses. Brush up on your writing skills and what goes into composing a good essay response – writing succinctly with correct grammar and writing on-topic. Looking For A Prep Class Online? So now that you’ve got a taste of what a superior AEPA Early Childhood test practice looks like, I bet you’re hungry for more. And I know just the place where you can fill up on the kind of insider secrets and knowledge that helps lead to a passing score – not to mention your Arizona teacher certification.